(67%) 10 of 15 customer would recommend this product to a friend. California Customers Please Note: South Coast Air Quality Management District (SCAQMD) Area of Jurisdiction REQUIRES a Low Nox Heater be installed. The following 6 California Counties are affected: Los Angeles, San Bernardino, Ventura, Orange, Riverside, & Kern. Installing a non-compliant heater in these counties will void the manufacturer's warranty and could result in a fine from your local code enforcement. When buying a replacement swimming pool heater, do you go by the BTU input or the BTU output? Hi. The heaters are sized using the BTU Input/output rating. The output rating determines the performance of the heater and the heating time. I have a 33 foot round above ground pool. I currently have a rp2100 model P-R265 A which needs to be replaced. What model Rapak heater would be the correct size for my pool? Hi. The P-R266A model will be the correct drop-in replacement to the unit you have. If you want to go with a higher BTU unit which will heat your pool faster you can. This P-R336A or the P-R406A model will be sufficient, you will also have to increase your gas line too. Hi. If your unit was manufactured prior to Oct 2004 you'll need Part # 010253F after Part # 013464F. Hi, Tom. This unit is part of the RP2100 Series. It can be used to replace an older version with the same specifications. Can the electrical wiring be switched to the other side as well? Hi, Scott. The electrical connection can be switched from the right side to the left side of the unit. See page 26 of the Raypak Owners/Instructions Manual. The current heater I have has all of the pipe connections on the left side of the unit and all of these have the connectors on the right. Am I able to get one with the connectors on the left so it lines up with the pipes coming from my motor and filter? Hi, Sherry. All of these units come with the water connections on the right. They can be changed to the left, this will have to be done by an authorized technician. What are the dimensions of this heater? I'm wondering if it will fit in my pump shed. Here is the technical data for these units including dimensions. Hi, Ron. You would need the Raypak R366A/R367 Indoor Stack Kit - 009840 to get rid of the toxic fumes that the unit releases. You do not want to have the fumes trapped in an enclosed area, Although it may be ventilated it may not be adequate. I am considering your 336 BTU heater. My pool heater sits to the right of my pump as you face. All your pictures show the hook ups on the right side of heater. Are they available with the hook ups on the left side of heater as you face? Can I use an Aqualink RS4 with this unit? 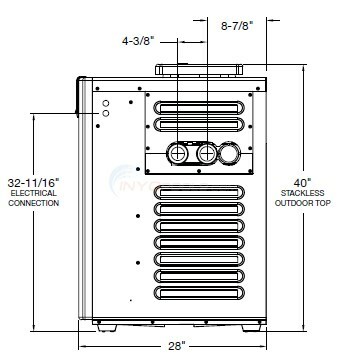 A Answered on 5/31/2017 by InyoPools Product Specialist Stacey M.
Hello, You can hook this directly to this with power supply, but you will not be able to control or adjust temperatures. I have an old Raypak RP 2100 that I am looking to replace. Is this a drop in replacement? What is delivery time to MA? Hi, Pat. This unit is the same as the Raypak RP2100 series units. Delivery to MA can take 3-5 business days. What type of electric does the raypak 336000 run of off? Also, if I read correctly 3/4" gass feed under 20' should be enough gass to run it correctly? I am eager to make this purchase so can you please let me know asap Thanks! Hi, Rob. This unit can be wired for 120 or 240 volts. A 3/4" gas line can be used for a run that is under 20 feet.
? Asked on 4/21/2017 by Dave S.
Is the Raypak 009218 (P-R336A-EN-C) a drop in replacement for my old broken heater which is a Raypak P-R335A-EN? Yes, that is a drop in replacement for your old RayPak heater. Do you carry the CR336EN version also and if so what is the cost and lead time for shipping,thanks David. For the RayPak heaters we carry the standard, cupro-nickel, high altitude, low nox, and commerical models all of which are usually in stock and usually ship out a day or two after the order is placed. What is the heat exchanger made of? And what is the warranty? The exchanger on this model is made of copper and the warranty is one year per the manufacturer's policy that you can view here. Hi D, Unfortunately, there is not a system available that can do what you want. You'll need to install a Pool Automation System. Hello Bob, The Raypak Heater 336000 BTU NG ELE has a decibel level of 50-55 dBA. Hi Frank, You will need the Raypak Heater 406,000 BTU NG ELE for your size pool, You can review our How Much Does it Cost to Run My Pool Heater? Blog to calculate heating cost. 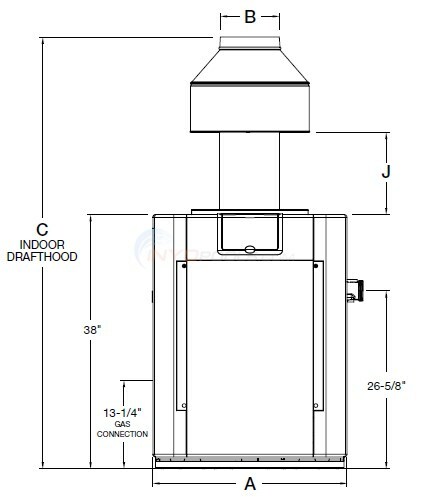 Hello Frank, You can use the 009218 Raypak Heater 336000 BTU NG ELE can be used to heat a pool and spa. If you would like to control this with a wireless remote you would need some sort of automation system. My current pool heater is 265k BTU (Raypak P-R265A-EN), is 15 years old and didn't work all last season, so I'd rather replace than repair. I was thinking of going up one model because I don't have a cover and it can be hard to get the pool temp above 80 degrees when the nights are cool in May and September. Will I use a lot more gas heating my pool if I replace it with the 336K BTU model instead of the 266K BTU model? Thank you. A Answered on 2/24/2016 by InyoPools Product Specialist Lennox H.
Hi John, Yes you would consume more gas with larger size unit. The 336 unit will also heat the pool faster than the 265. I would highly recommend using a Solar Cover or Liquid Cover to prevent water evaporation and heat lost which will save you money when it comes to heating your pool. Hi Len, It would be good to cover your heater during the winter months. The Pool Heater Cover-One Size Fits Most will work with the RayPak heaters. MY RAYPAK HEATER CLICKS BUT IT WON'T IGNITE. THE WATER FILTER IS CLEAN AND RUNNING AT THE APPROPRIATE PRESSURE. WHAT COULD BE THE PROBLEM? A Answered on 7/1/2015 by InyoPools Product Specialist Wes B.
Hello Vic, It could be a few different problems. To properly troubleshoot the issue I would contact Raypac at 805-278-5300 or have a pool company come out to look at the heater. Hi Len, The Raypak 406000 NG ELE unit will heater your pool or spa faster than the Raypak 336000 NG ELE unit because it has a higher BTU output. Len, We do not sell the Raypak 399,000 BTU NG ELE heater but we do sell an equivalent Raypak Heater 406,000 BTU NG ELE heater for $1,899.99 with free shipping. My heater is about 85' from the gas supply and my existing line is 1", the pool holds about 38,000 gallons, which heater could I use and not have to dig up the old line, it's under the concrete pool deck! Hi Wally, The largest BTU heater you could go with on a 1" line at 85' would be the Raypak 206,000 BTU Model as this heater can be used on a 1" line up to 90'. How long would it take to get this item? Hello Paul - The delivery time would be 7-10 business days. What is involved with electrical hookup? We can get you the instructions for the installation, but to keep the heater under warranty you would have to have it installed by a licensed electrician. I called customer service and ordered a replacement. Customer service rep was courteous and the transaction was quick. You can't beat their prices with free shipping it was $700 cheaper than a quote from a local pool store! Shipping was quick too. Hook it right up with minimal effort and we're good to go. Thank you INYOPools!!! 17 yr. Old Raypak heater stopped working. Ordered the same sized raypack from inyo pools at a great price. The size and hookups were the same as the old one so no new plumbing was necessary. My biggest concern was that the company warranty would not be allowed unless installation was done by a licensed contractor. Since the heaters were basically identical, I decided to do it myself. Out with the old, in with the new. Took pictures of the old electrical hookups and installation was easy. New O- rings and the plumbing was done. Everything matched up perfectly. Opened the pool the next day and crossed my fingers when I turned on the heater. Two sparks and it kicked right in. The price was 300.00 less than any other pool stores for the same unit and installation by a dealer would have been an additional 300.00 or more. I just opened my pool this year (2nd for the heater) and it kicked in after cleaning out the gas tube. It seems spiders build webs over the winter and sometimes prevent gas from flowing. Cleaned the line and heater kicked in. Very happy. After 20 years, the burner supports for by old millivolt Raypak finally rusted out. Our primary use for the heater is to heat the spa so we upgraded from a 220,000 to this 336,000 BTU and it really speeds up the time to get the water to 100 deg. The old millivolt required removing all the wiring and cleaning the connections about every 7 years. The new spark ignition is great. Inyopools shipped the heater the same day that I ordered it. Great service, easy installation. Hope this one lasts as long as the old one! Love my new heater. I had it put in to replace an old Raypak. It was a quick and easy swap out, and works great. I had always been familiar with Hayward products. I had not been familiar with Raypak until I needed to replace my Hayward heater (300k BTU). Through my search for a heater with a similar hookup to the old Hayward heater (gas input on the left and electric on the right), I ran across Raypak. I am familiar with Rheem, so I thought I would give it a try, especially since the INYOPools price was very reasonable. The heater arrived on time and in perfect condition. Since I am fairly handy, so I decided to hook the electric and water up myself (I don't touch gas because I don't want to blow anything up). The electric was very easy to hookup. The line connects directly on the outside of the heater rather than being hooked up to a junction box inside the heater like my Hayward heater. The wire were clearly mark. So it was easy to wire the electric. The water hookup took a little longer. This unit is rather tall compared to other heaters. Check the dimensions to make sure you have enough headroom for the heater. The water input and output was at the same height as the output from my filter. So, I had to completely rerun the PVC. Thank goodness that PVC is easy to run. It took a few more 90's that I usually like to have. I had a professional hook up the gas last. Once it was hooked up, we turned it on. It fires up with no problem. In fact, I couldn't even tell it fired up until I felt the heat above the heater. This unit is very, very quiet. Also, it heated my pool in less than half the time of the 300k BTU Hayward heater I had. I have a 21,000 gal pool. The 300 BTU Hayward heater heated my pool about 1 degrees per hour. This unit heats my pool between 2 and 2.5 degrees per hour. It seems like a very efficient heater. I am very happy with this product. It looks well constructed and it does not seem like it will rust. I am a new Raypak convert and will consider their products whenever I need to replace this heater and recommend them to my friends. I would recommend their products to anyone who needs a new pool heater. Very reliable heater. My original raypack heater lasted 17 yrs. With very few problems. I replaced it last year with the new identical 336000 raypack. Hook-up was a snap and have no problems to date. Looking forward to another 17 years. Well built heater, received in the timeframe promised, well wrapped for shipping. Great pricing too; love that shipping is included. Only downside is that the heater was advertised as high efficiency, but when it was unwrapped, the yellow EPA tag described it as the lowest efficiency among it's competitors. I called to complain, and everyone points fingers at everyone else ("that's what the manufacturer told us....") Nobody stepped up and that's unfortunate. Installed easy and heats things up quick. Good product and would highly recommend.